Searching for the most effective way to reach your clients and prospects? Direct Mail may be the answer you’re looking for. According to the US Postal Service, 98% of consumers bring in their mail the day it’s delivered, and 77% sort through it immediately. Now, imagine a piece of Direct Mail strategically delivered to one of those consumers, filled with information that addresses one of their immediate needs. It’s like scheduling a face-to-face meeting with your ideal consumer, since Direct Mail gets you literally in the front door! Hit your target. By contacting only your ideal client, you eliminate unnecessary marketing efforts and drastically increase your return on investment. Connect on a personal level. Addressing your clients by name, and offering them service based on their needs, forges an automatic connection which makes them more likely to respond. Customize it your way. 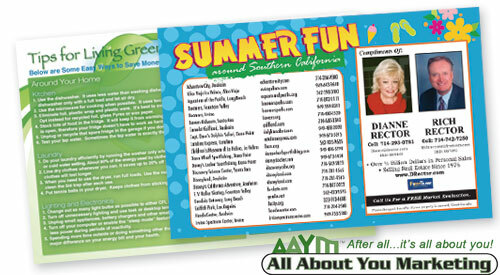 Infusing the unique traits of your business into your Direct Mail pieces is easy, and we offer an endless variety of options to meet your needs. Give them something to hold on to. Physically placing your message in your customers’ hands engages them in a tactile way, and providing them with useful information encourages them to keep your piece handy. Market yourself effortlessly. We serve as a one-stop-shop for all your marketing needs, including Direct Mail campaigns that will help grow your business. We do the work, and you see the results. Contact us today to learn more about our Direct Mail services and how we can help you get connected to your target market.